Adidas and Nike are once again the dominant shirt suppliers for this year’s World Cup Finals. Puma and Umbro have snuck into the market with a few designs of their own, alongside some other smaller brands such as New Balance, Hummel, Ramei and Uhlsport. This year, adidas have trumped Nike with a total of 12 kit designs, with top teams like Germany, Spain, Belgium, Colombia and Japan showing off the iconic Three Stripes in the summer. Nike are now the official kit suppliers for England, as well as Portugal, France, Brazil and Nigeria. Umbro have stepped down the pecking order slightly in recent years. But this summer they are looking to sneak back onto the scene with some classy and underrated designs for some of this World Cup’s dark horses. The South American outfit are back in the World Cup for the first time since 1982. To announce their return to the world stage, Umbro have designed a throwback kit similar to the one they wore last time they appeared in the competition. The red sash across white shirt is a recognisable Peruvian design from generations past. 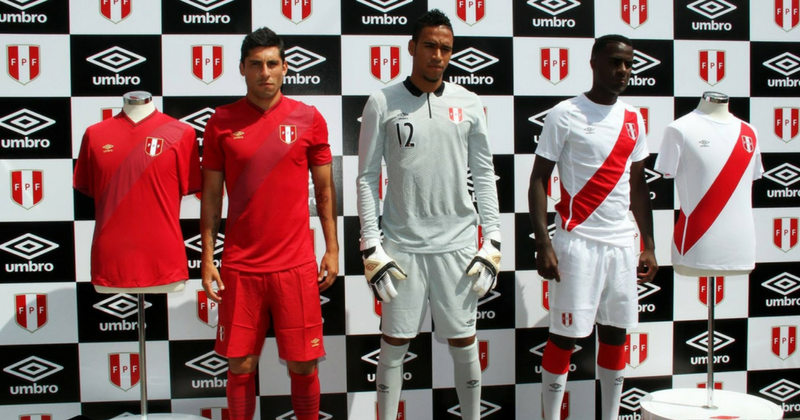 Umbro have updated the sleek design to give Peru a fresher and more unique look when they step out in Russia. Umbro were all set to produce the Serbian kit for the World Cup until Puma were faced with a huge dilemma; Italy, Ghana and the Ivory Coast – all with kits provided by Puma – failed to reach the finals. With only two teams representing Puma left in the tournament, the big brand acted fast to sign a deal with Serbia ahead of the tournament and also took over from Umbro as Senegal’s kit-maker. Poor Umbro, right? So Umbro are set to miss out yet again as Puma have left them with only one kit left in the tournament. Their design for Serbia was a crisp clean white with red trim; a somewhat underwhelming yet sleek look. The only questions is: which football kits will make it all the way to the World Cup Final on 15th July 2018?